The former President of Argentina and the husband of the current Head of State, Néstor Kirchner, died on Wednesday following a sudden heart attack in the Patagonian town of El Calafate, near the Chilean border. The former president had successfully undergone heart surgery in September and had been planning to run for president again in 2011, with a view to taking over the position he has shared with his wife Cristina Fernández Kirchner since 2003. He was 60 years of age. 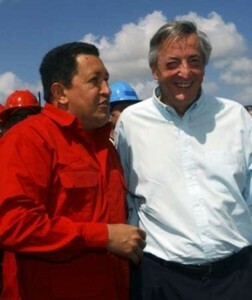 Kirchner was head of the ruling Peronist Party, and in addition was acting Secretary General of Unasur (the Union of South American Nations) which includes every independent nation in South America. Popular among large sections of Argentina’s population for having brought stability to a country ravaged by economic turmoil at the turn of the century, the Kirchners’ reign has not been without controversy. The couple’s personal wealth and holdings increased six times over between 2003 when Néstor first took office and July of 2009. Consequently, the pair have been accused of using personal connections to buy up Patagonian land at preferential rates and sell it on at vast profit, even as economic misery continues to blight much of the country. In 2009 it was revealed that the Kirchners, who are both qualified lawyers, had amassed 28 properties with a total value of US$3.8 million, four companies worth US$4.8 million and held bank accounts containing a total of US$8.4 million. Despite their opulence, the couple had earned support from many within the country for standing up to the International Monetary Fund, with Néstor Kirchner’s presidency marked by a refusal to cave in to IMF austerity demands, and the country’s economy subsequently rebounded following substantial loans from the Venezuelan government. 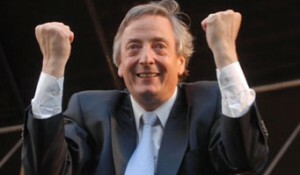 Kirchner won praise from organised labour groups, allying himself with Argentina’s largest unions and speaking passionately against the effects of the rampant influx of foreign capital, and his opposition to the IMF gained him much support in a nation ravaged by foreign debt at the end of the twentieth century. The former president also made a point of tackling some of Argentina’s most prominent media conglomerates, attempting to reign in the control of large private groups such as Clarín which control large chunks of Argentina’s domestic media. The “presidential couple” had made been vociferous critics of Clarín’s history of supporting the military junta which controlled the country with an iron fist between 1976 and 1983, and passed laws seeking to break the stranglehold of large corporations over the media, restricting private ownership of printing presses and other assets. As news of the former president’s death spread, Clarín’s stock price surged 22 percentage points; its largest single day gain since June 2009. 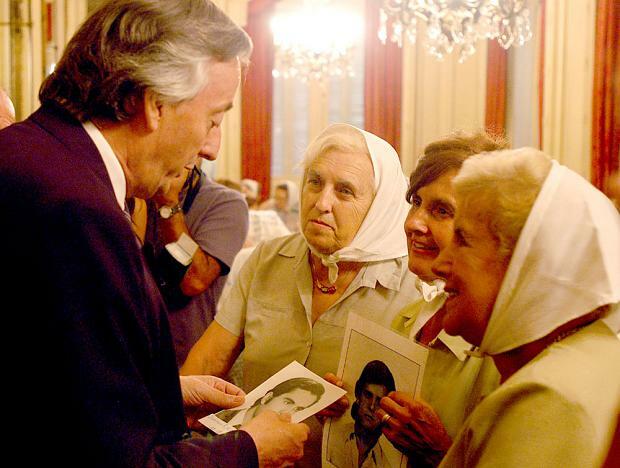 Another aspect of Néstor Kirchner’s presidency which won considerable acclaim within Argentina was the commencement of legal proceedings against dictatorship-era government and military figures suspected of complicity in human rights abuses, disappearances and politically motivated torture. Estimates as to the number of people forcibly “disappeared” by the government in this period range as high as 30,000. 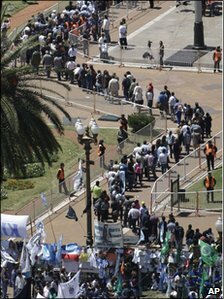 Kirchner won praise from victims’ family groups who continue to demand justice for their loved ones, and his death was met with a mournful display of remembrance from the Madres de la Plaza de Mayo group, comprised of the mothers of people who were killed by the state during this period. Tributes to the deceased president, who is survived by the current Argentine president and two teenage children, poured in from all over Latin America. Ecuadorian President Rafael Correa called him a “great patriot” as thousands of people gathered in the Argentine capital to pay their last respects. 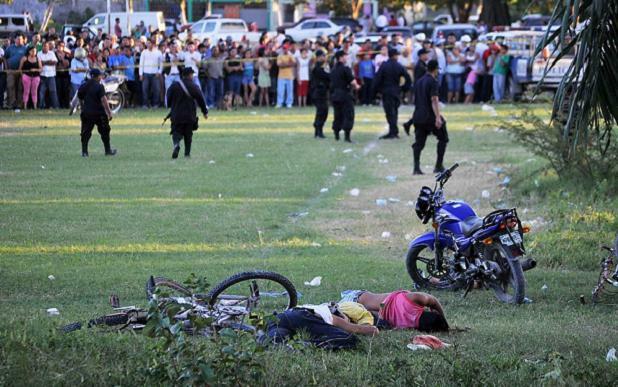 14 people were murdered on Saturday morning as a gang armed with AK-47 and M-16 rifles stormed an amateur football match being played between local teams in the town of San Pedro Sula in the north of Honduras. Security Minister Armando Calidonio, speaking on behalf of the illegitimate Lobo government, said that the possibility that “this was part of an effort to settle a score” could not be discounted. “This type of thing only happens when there are mitigating factors, like some type of illicit business” continued Calidonio, much to the anger of relatives of the deceased. Rosa Elena Valdez, the mother of one of the murdered men and the mother-in-law of another, reacted furiously to the suggestion that her loved ones had been targeted out of revenge related to illegal business. “This man can’t say that. My son was an honourable person who was dedicated to running his barbershop,” she told reporters. The mother of another victim was equally appalled by the minister’s inference, saying her son was “without vices”, and advising Calidonio to “investigate well before giving his opinion.” Jorge Leonel Ramos, who was one of the game’s linesmen, recounted from his hospital bed that two armoured vehicles had pulled up containing a group of around 10 gunmen. 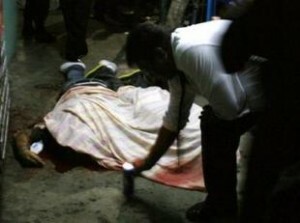 They instructed those present to lie on the ground, before beginning to shoot “indiscriminately” into the crowd. Ramos himself survived despite being shot four times. Honduras has endured a wave of violence in recent months, with lingering political instability following the coup d’état which deposed elected President Manuel Zelaya in June of 2009 exasperated by near total impunity for violent criminals, as upwards of 95% of cases go unsolved. The north of the country of 7.6 million, one of the poorest in the Americas, has been particularly badly affected. In early September a massacre at a shoe factory left 14 dead, and two weeks ago six adolescents were killed in the same region when a house they were in was firebombed. Dilma Rousseff of the incumbent PT (Workers’ Party) took a comfortable victory as Brazilians voted in the second round of presidential elections on Sunday. 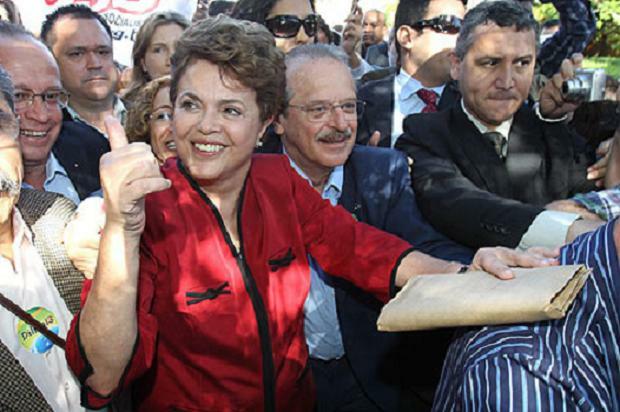 Dilma had benefitted from piggybacking on predecessor Luis Inácio Lula da Silva’s record, as the man who rose from rural poverty in north-eastern Pernambuco to the country’s highest office via years of trade union activism bows out with an approval rating of over 80%. Lula will continue to serve until January 1st 2011, and the newly elected leader will join the current president on an upcoming tour of Asia as she attempts to boost her global profile. Rousseff beat run-off rival José Serra of the Social Democrat Party (PSDB) by over 11 points as around 55 million voters gave Lula’s legacy a ringing endorsement, however her popularity does not come close to that enjoyed by the former President as he prepares to clear his desk. The 62-year-old economist becomes the third female head of state currently in power in Latin America, alongside Cristina Kirchner in Argentina and Laura Chinchilla of Costa Rica. As the election of the country’s first female president will doubtless make the headlines, the real elephant in the room is still yet to be tackled. Despite making up over half of the nation’s population, black Brazilians, who comprise the largest population of black African origin in any country behind Nigeria, are still largely unrepresented by the country’s political system. Indeed, they still suffer more than any other group from poverty, a lack of access to healthcare and education and imprisonment. Despite moderate advances made in combating poverty during Lula’s presidency, Brazil still deserves its unenviable reputation as one of the planet’s most unequal countries, and the root causes of social disenfranchisement are yet to receive serious attention. Regional disparities also persist, with the country’s North East, which received the bulk of African slaves imported to Brazil until the trade was outlawed in the 1831, considerably poorer on the whole than the South and South East of the country, home to the country’s most significant industries. It is estimated that Brazil received around 40% of all slaves exported from Africa to the Americas during the years in which the transatlantic trade prospered, and slavery was not officially abolished in Brazil until 1888. Nine members of the Jalisco state police force were ambushed and killed on Thursday as their convoy rolled through a rural highway in the western state. The attack took place in a mountainous region close to the town of Jilotán de los Dolores, some 250 kilometres from Mexico’s second city and Jalisco’s state capital, Guadalajara. Around twenty police officers were undertaking a routine patrol in the area when their five vehicles were set upon by a group of bandits in a convoy of ten pickup trucks. The group attacked the officers with AK-47s, assault rifles and a grenade launcher, killing nine and wounding ten. The gang then fled the scene and has yet to be apprehended. Police in the city of Zapopán also reported that five people including two children were wounded following a grenade attack in the municipality. They had been walking past a house when a grenade was thrown at the property from a passing vehicle. Five people were also reported injured following two grenade attacks in the city of Monterrey, in the northern border state of Nuevo León. Mexican President Felipe Calderón this week vowed to maintain the prohibition of drugs such as marijuana and cocaine. Profits from drug sales continue to be by far the most significant motivation for gangs responsible for the escalation of violent attacks the country has witnessed since 2006. Calderón’s recent announcement comes weeks after the Mexican president called the proposed legalisation of marijuana in the U.S. state of California “absurd”. He said that relaxing drug prohibition laws would have “serious consequences for American and Mexican society”. Over 28,000 people have been murdered in Mexico as a direct result of the current president’s policy of stepping up measures to target criminal gangs linked with the drug trade. This has seen armed groups frequently outgunning state forces and acting with de facto impunity from prosecution due to judicial corruption and a climate of fear which has seen many state officials who have gone after violent criminals getting murdered themselves. Statistics released this week confirm that October was the bloodiest month of 2010 thus far in the city of Ciudad Juárez, a municipality close to the U.S. border which has been ravaged by drug-related violence. 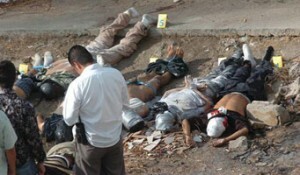 State figures note 350 murders in Juárez last month, an average of more than 10 a day in a city of around 1.4 million.